During the reporting period destruction and seizure of Palestinian property continued in the occupied West Bank including East Jerusalem. 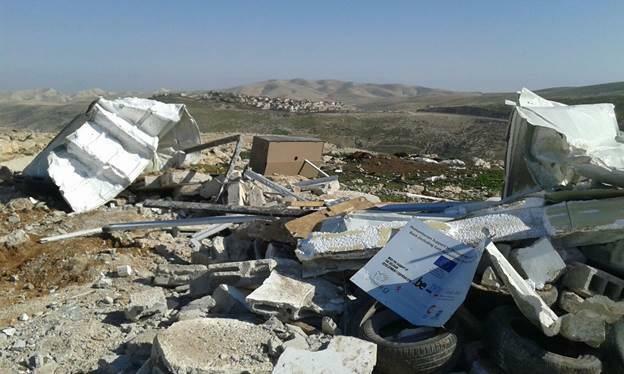 From September 2017 to February 2018 over 165 Palestinian owned structures were impacted by demolition, seizure, sealing off, or eviction throughout the occupied West Bank including East Jerusalem. Almost 40% of the incidents took place in East Jerusalem. This brings the total number of affected structures in the West Bank including East Jerusalem in 2017 to 423, resulting in the displacement of over 600 Palestinians including 360 children. Of the structures (such as classrooms and residential structures) targeted over the 6 month reporting period, 22 structures were funded by the EU or EU Member States (EUMS) for a value of nearly 60,920 €. This brings the number of EU funded structures targeted in 2017 to 80, constituting 19% of all Palestinian owned structures targeted by the Israeli Authorities, compared to 17% in 2016. Of particular concern is the demolition of EU donor funded structures serving as classrooms during the reporting period, as several were also targeted in the last reporting period. Presently, a total of 44 Palestinian schools have been identified as being at risk of full or partial demolition due to outstanding orders, potentially affecting close to 5,000 students. Half of these schools have been provided with some form of assistance from the EU. Plans to evict specific communities continued, including communities in the Jordan Valley, Bedouins in Khan al Ahmar, east of Jerusalem, and Susya in the South Hebron Hills.